Check out my new post over at Muslim Matters, we’re having a lively discussion in the comments. Ruth Nasrullah, a former MM writer expressed similar sentiments two years ago in her Women and the Wall post. One bitterly cold and windy weekend here in Washington DC, a friend and I decided to visit the U.S. Botanic Garden, which is located indoors. We left the garden shortly before sunset and decided to head over to a local restaurant to get a bite to eat. On our way, we could tell from the sky that the time for maghrib prayer was near. As I began to wonder where we would pray, the iconic minaret of the Islamic Center of Washington, DC just down the road came into view. Alhamdulillah, I thought, we can stop and pray there. In warmer weather I do not mind finding a spot to pray outside, but as this day was particularly cold, I was grateful for the opportunity to pray in a warm mosque. We parked on the road and as we prepared to walk inside, an older brother of uncle-age turned to eyeball us on his way into the masjid. I reminded him to lower his gaze, and he hurried inside. Despite the cold weather, we walked around the building looking for a separate women’s entrance but couldn’t find one. Surprised, we entered through the same doorway used by the brothers and up the same narrow shared staircase to the shared shoe racks to the shared entrance to the upper level main prayer room. All this equality and equal access was quite remarkable and rather baffling, particularly because for Friday prayers, the cramped women’s prayer area is little more than a glorified basement broom closet. In the years since becoming Muslim, I’ve come to expect separate and unequal, if not downright shoddy and dangerous accommodations for sisters in most masajid. 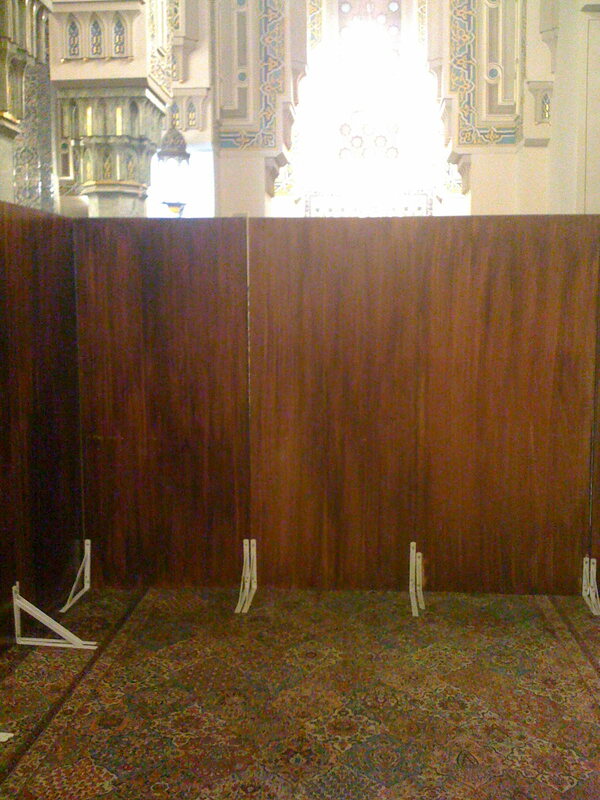 My friend asked me where the sisters pray and I told her there is some space blocked off for us in the main hall. She went in to find it but I held back, timidly, feeling a nervousness that has developed from my experiences of being a woman that desires to pray in the masjid. She motioned me inside, and we walked over to the area reserved for sisters. 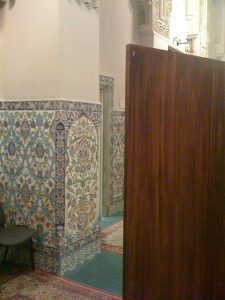 We listened to the adhan, and as my friend had never before visited the Islamic Center, she took in the sights of ornately decorated walls and ceilings. We prayed our sunnah and waited for the prayer to begin. My friend asked me about the right of women to see the imam, a topic we had learned about in the AlMaghrib Divine Link: Fiqh of Salah seminar. 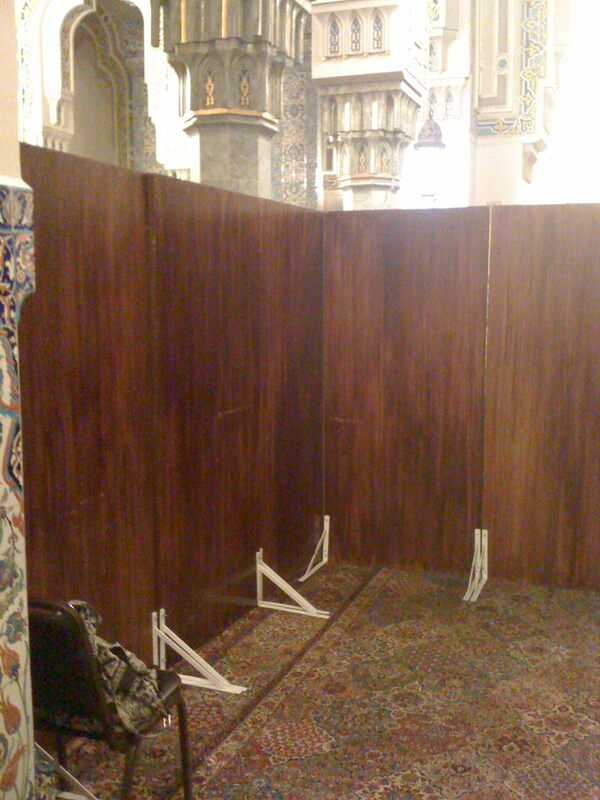 She tried rather unsuccessfully to peek through the narrow cracks in the large wooden dividers to gauge whether she would be able to see the imam. I then suggested that we pray in the main section, in the back, behind the men. Not really much cause for fitna (discord) as there were barely two rows of men and ample prayer space. She agreed. I must say, I felt somewhat nervous while waiting for the iqamah, our cue to escape from the penalty box/women’s prayer area and enter the main prayer area. I felt for a moment what Asra Nomani must have felt standing alone in her masjid in Morgantown, West Virgina (and I don’t agree with her on most matters), and also what countless women, forced into cramped, crowded, and unseemly prayer spaces in far too many of our communities, feel each time they desire to worship their Lord in the mosque. After the iqamah, the scant two rows of men lined up, and we lined up off to the left side toward the back. One easily could have placed a dozen rows of worshippers between us and the men. We did something quite revolutionary, we prayed maghrib salah in the main room, outside of the penalty box, and then we prayed our sunnah. There were no fireworks, no angry shouts, and most of the brothers left quietly after they prayed. 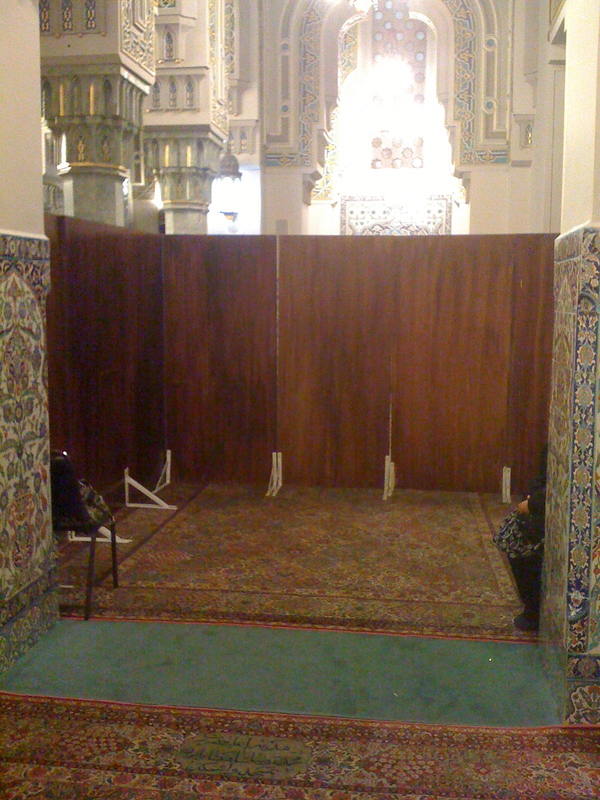 One lone brother just could not resist telling us that the prayer space for women was located inside the penalty box in the back right hand corner of the mosque. When we said that we preferred to pray over here to be able to see the imam, he countered by telling us that the brothers who come late like to pray in the back (as if they could not find any other space to pray in that huge mosque). Seeing that we were unimpressed and unmoved by his feeble arguments and attempts to persuade us, he also left. My friend then humorously suggested that the area designated for the women would be more rightly utilized as a penalty box for the men who come late to the salah, as a rebuke and punishment. I’ve been reflecting upon this experience and others, and it occurs to me that I entered into Islam believing that I had found a religion which dignified and validated my existence as a human being. I continue to believe as Jafar ibn Abi Talib said to an-Najashi, the Abyssinian king that hosted some of the early Muslims, that we were a humiliated people before our Islam and within Islam we found our dignity and honor in rejecting falsehood and in worshipping God alone. In my own local community, I once took it upon myself to ask the shura members of a mosque not for equitable prayer space, nor to pray in the same room, nor even to be able to see the imam; I simply asked that the outside doors on the sisters’ side not be locked and chained shut from the inside, as I had learned in childhood that chains on doors are a dangerous fire hazard. The responses I received were disheartening: most seemed unaware that this serious fire code violation had been a routine practice, and one questioned the perceived “critical” tone of my email. But alhamdulillah, the chains have not been seen on the doors for some time. Equally disheartening are the seating arrangements at some AlMaghrib Institute seminars, where brothers are given the front rows closest to the instructor and sisters are given the back rows. Particularly in locations that have upwards of 500 students, being in the back is akin to sitting in the cheap seats atop the US Open’s Arthur Ashe stadium. The irony is that sisters are still charged the same $165 tuition fee for often inferior seat choices and options. It is true that some women proudly assert their right and preference to sit in the back and some men complain that they will be too distracted by the sight of a woman in a classroom to be able to focus on the material being taught, even though they somehow managed to focus throughout their years of secular education. Yes, these may be valid concerns, but why is my right or the right of other women that come early to secure a seat in the front, where we feel that we can better focus, not also given the same merit? Why should a disinterested, sprawled out, reclining, and dozing-off brother be given preferential seating over a serious, awake, interested, and motivated sister? 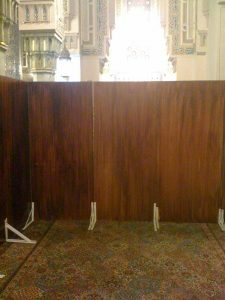 At the most recent AlMaghrib seminar here in Maryland, brothers and sisters prayed in the same barrier-free room and everyone behaved themselves appropriately. I sometimes feel that by placing barriers we not only assume the worst but absolve people from needing to take responsibility for their own actions. How will individuals learn to act appropriately in the presence of the opposite gender outside Islamic bubble environments in the wider barrier-free world? On the last day of the most recent AlMaghrib seminar in Maryland, the instructor asked the students to move down and come closer in order to fill in the gaps in the first rows. So some sisters moved down to the left-hand side of the very first center row which had been occupied by a few brothers on the other end. There were several unoccupied chairs in between them and I hesitated whether or not I (as the ameerah) should ask the sisters to move back a row or two. 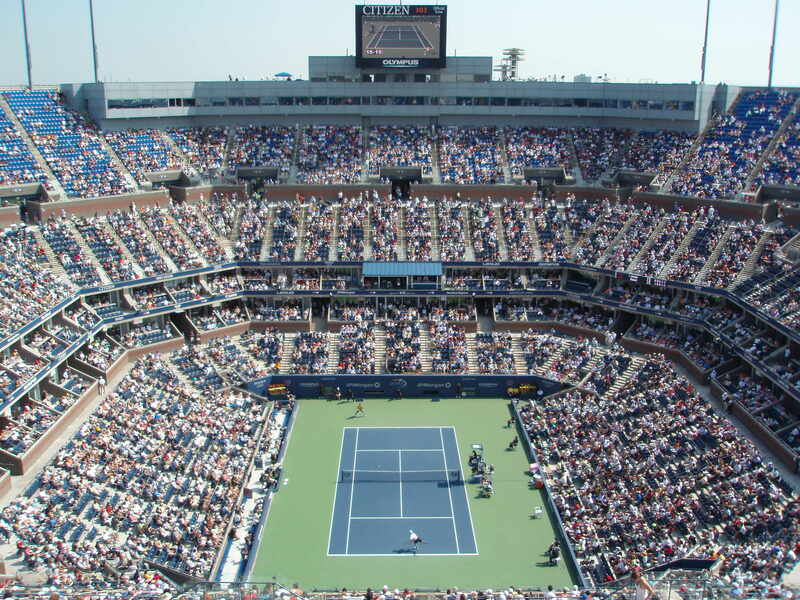 I decided against it and let them remain in their chosen seats. These are mature adults, both men and women, they paid for the seminar, they desired to sit in the front row closest to the instructor, and I saw no reason to move them as they all acted in an appropriate manner. But, it’s not compulsory for sisters to attend the masjid; it’s better for them to stay at home and learn from the men-folk when they return. However, the reality is, the men who pray in the masjid are few, and a sister who has striven to come to pray the salah at its proper time in a masjid should not simply be excluded by virtue of her gender. Nor should she be forced to pray in sub-standard conditions with her children: conditions which no man with any sense of fairness, let alone a modicum of authentic gheerah, would allow for himself or his family. The reality, particularly in the West, is that the majority of students and volunteers in many Islamic environments are women. If women did not go out and actively seek knowledge, they certainly would not get it from their missing-in-action brothers, fathers, sons, and husbands (assuming their family is Muslim, which is not the case for many converts). I’ve been contemplating a project to photograph as many women’s prayer spaces as I can in the various mosques I visit and then to publish them on a new photoblog, highlighting the good and shaming the disgraceful ones. In discussions such as these, in which emotions run high and rationale is often thrown to the wind, a picture is often worth more than a thousand words. Muslim women are also believers for whom Allah made the whole Earth a mosque so why do men prohibit us from using something that Allah has given us. + And the narrator continues to say, that `Abdullah Ibn `Umar said to his son, “I swear by Allah, I will never speak to you again for the rest of my life due to what you just said.” ~ and indeed, he never spoke to that son of his till he died. He did this as a form of “censure” or reprimand… to show his strong disapproval of what his son had said. * And yet, in other narrations, it is mentioned that ‘Abdullah Ibn ‘Umar (رضي الله عنهما) was so shocked by his son’s outrageous statement that he immediately began to search the ground for anything that he could throw at his son.